Many of you may have laughed at Zack tonight because he confused a picture of the Solar System with a model of the atom. But, building on that similarity a century ago won Niels Bohr a Nobel Prize. Is that represent a planetary system or an atom? Newton’s second law says that a force, such as the attraction of gravity between the Sun and the Earth, causes a directly proportional change of acceleration: “Force equals mass times acceleration”. Acceleration is just a definition: a change in velocity per time. When you say your car goes from “zero to 60 mph” in 10 seconds, that’s a description of its acceleration. But the Earth’s speed changes by less than 2% from its average over the course of a year and its average has barely ever changed in over 4 billion years. If our orbit were perfectly circular, it would not even change at all. What happened to all that acceleration that the force must produce? The missing point is that velocity is not just speed, but also direction. Every six months, the Earth completely changes its direction as viewed from the Sun. In such a circular orbit, the acceleration changes the direction of the motion not its rate…so velocity is still changing. Newton’s second law also says the acceleration points along the same direction as the force. A common misconception is that the acceleration of the planet in circular orbit points along the direction of motion. But the force of gravity points along a line between the Earth and Sun. So the acceleration cannot be pointing along the direction of such a planet’s motion. The acceleration must somehow point along the same line between the Earth and Sun. That is, it points at right angles to motion along the circular orbit. So the planet changes direction but not speed and is still accelerating. A planet in circular motion can be acted on by a force forever, but its speed and thus energy never change. Richard Feynman put a fine point on it. In the time of Kepler, many stated that the Earth moved because angels pulled the Earth along, flying ahead of the planet. Newton showed us though that this model cannot be correct. The angels must be pulling on us inward towards the Sun, thereby creating our (essentially) circular orbit. Back in the early 1900’s, the existence of atoms, indivisible units of the known elements, was largely, and correctly, in favor. What nobody knew, was the structure of an atom itself. Theories abounded, that were all reasonable. In the “plum pudding” model guessed by J.J. Thompson, the discoverer of the electron, there was an equal mix of positive and negative charges (protons and electrons) all mixed up uniformly in a kind of goo. Not a bad guess but wrong. Another model described atoms as cubes, with electrons at the corners. A Japanese physicist, Hantaro Nagaoka, guessed a model with electrons surrounding a central positive charge arranged in a single disk, at a constant radius, much like a narrow ring of Saturn. All these models were reasonable. In fact the plum pudding model turned out later not to be a bad explanation for the structure of the nucleus. No amount of theoretical calculating would resolve the impasse. It took an experiment to point the right way forward. In Ernest Rutherford’s lab, evidence was seen that alpha particle (positively charged particles) scattered off of a densely packed solid nucleus. So the closest winner among the predictions above was the Saturn-like, or planetary model—which unfortunately predicted essentially nothing correctly. Niels Bohr quickly refined that model to one with electrons orbiting a central nucleus at different distances. He had the electrons orbit the central nucleus at a constant speed and distance, much like a planet, but with the force of gravity replaced by the force of static electricity between the (negatively charged) electron and (positively charged) nucleus. He helped start quantum theory by assuming that, unlike planetary systems, electrons could only orbit the atom’s central nucleus at specific, fixed distances. Experiment showed that Bohr’s model worked better than the Saturn model because it explained the specific values of light frequencies emitted by atoms. That left us with the picture of the atom so popular in popular culture, with little electrons zipping around a central nucleus just like planets around the Sun. The planetary model of the atom is most familiar. It was the first to make good predictions. But it does not work completely. Almost immediately physicists knew that Bohr’s planetary model of the atom could not be the final story. It is a fact that accelerated electrons radiate power. That is actually how a radio transmitter works, it accelerates the electrons in a metal antenna. But since atoms can be stable forever, with their orbiting (accelerating) electrons, something was wrong. Bohr finessed the issue by saying an electron could not move closer than a minimum radius. But worse problems could not be solved. 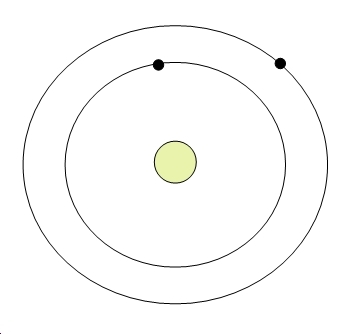 An electron truly orbiting a central charge would do so in a particular direction, and therefore have angular momentum. But experiments said otherwise, that it could even be zero. No orbit around a central body can have zero angular momentum. Ultimately the planetary model was killed by these disagreements with data. Only the with advent of the full quantum mechanics, including the Shroedinger wave equation, could a picture be made consistent with all that was observed. In this, better working, picture the lowest energy electrons exist in a kind of cloud around the nucleus, with nothing orbiting at all. Unfortunately, when quantum mechanics becomes key, there is no familiar system, such as planets’ orbits, to compare it to. In the modern picture of an atom, there are no orbits, just a cloud of probability of finding the electron. Zack wouldn’t confuse a cloud of electron probability with a planetary system. Since the planetary model of the atom is dead, one could even say his was a better guess than Leonard’s. In a strange way Zack had a point when he said, “That’s what I love about science–there’s no one right answer.” Science typically moves forward with multiple of guesses, such as the Saturn ring model of the atom. Several explanations often co-exist until experiments weigh in and pick some, one, or none. Tonight Amy prepared a brain sample for her two-photon microscope. A two-photon microscope works on a principle that violates the basic statement of Einstein’s work that won him the Nobel Prize. 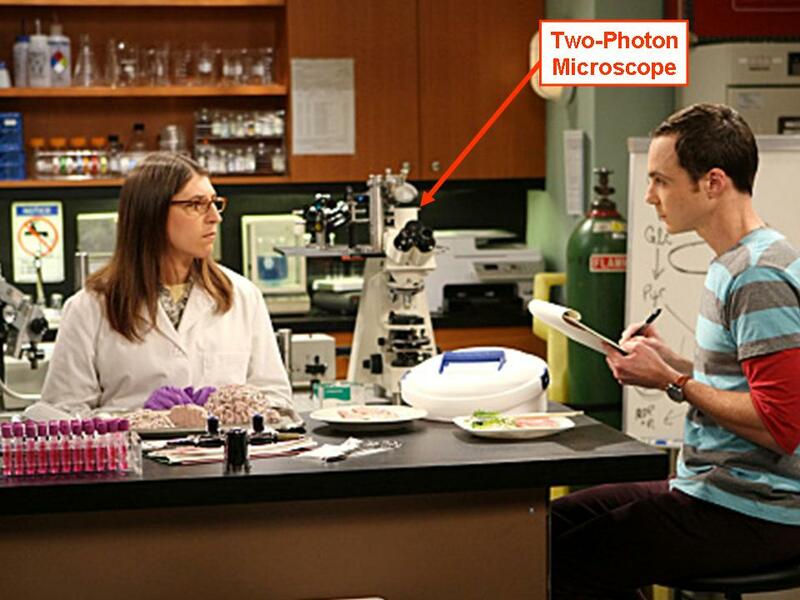 Amy Farrah Fowler prepares samples for her "two-photon microscope". Einstein was busy in 1905, often called his Annus Mirabilis (his “Miracle Year”). He produced his work on special relativity– but he never won a Nobel Prize for that. He produced the linchpin for an elementary explanation for thermodynamics–but never won a Nobel Prize for that either. Einstein’s Nobel-Prize winning work that year explained the most basic interaction of atoms with light, and forever changed our view of light. 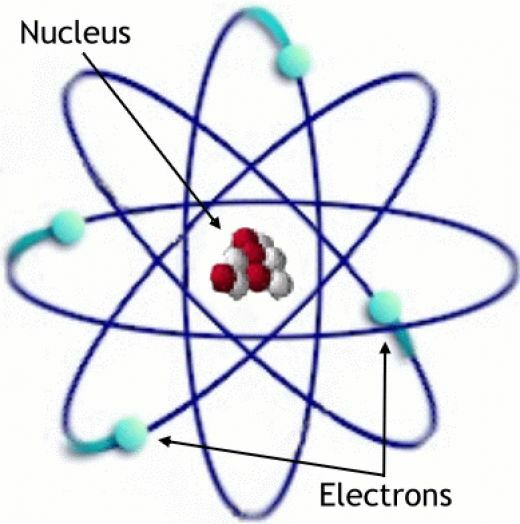 Atoms are made of two charged particles, protons and electrons. Through those electric charges they interact with light. Modern physics has been studying these interactions for over 100 years and is the basis of everything from lasers to making pornographic pictures in airports backscatter X-ray scanners at airports. Einstein’s Nobel Prize explained how only light above a certain energy will free an electron from atom: Giving a small amount of energy to an electron in an atom may wiggle its orbit a bit, but won’t break it free. Only with a large enough kick can an electron be separated from its atom. But physicists found that visible light, no matter how bright, would not knock electrons free from a material, while even a weak ultraviolet light could. Einstein proposed a solution. He predicted that the energy of a beam of light was carried by individual particles of light, now called photons. He borrowed the idea from Max Planck, who had assumed such quantization to explain the color and brightness of hot objects. But now Einstein took the idea not just as a mathematical trick, but as a real description of the nature of a beam of light. So light would collide with atoms like two billiard balls. For most materials, visible light particles do not carry enough energy to knock electrons out of atoms. Only ultra-violet light has enough energyto knock out electrons. No matter how intense you make a the visible light, the story goes, you will never knock out electrons because the individual photons do not have enough energy. Because this represents one of the most basic interactions of light (the photons) with electrons is called the photoelectric effect. During my own undergraduate days we demonstrated this effect in our student laboratory. We shone light onto a metal and looked for a charge buildup due to escaping electrons, just as it would if it were exposed to static electricity. But no matter how intense the visible light, no charge was built up. But a small ultraviolet lamp, such as you might use in a tanning bed, quickly charged the metal. Only ultraviolet photons have enough energy to knock out electrons, so there is a minimum for anything to happen. This is the same reason that rays damage your skin so easily, but visible light does not. “Wait!” you might be thinking. What if the atom could absorb two particles of light, “two-photons”, at once? Couldn’t the combined energy of two low-energy, even infrared photons, be enough to kick out an electron? And you’d be both right and eighty years too late. The effect was predicted by Maria Goeppert-Mayer in her 1931 Ph.D thesis. She later went on to win a Nobel Prize of her own for completely different work, explaining the structure of the atomic nucleus. In her 1931 Ph.D. thesis, Maria Goeppert-Mayer discovered an effect Einstein missed: two-photon absorption. This became the basis of the two-photon microscope. The effect is very small, since two photons must combine with the atom at the same time. 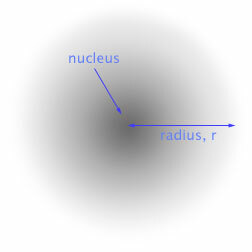 Most collisions of light with atoms are so small they are characterized by a small area. In my undergraduate lab we did not have anywhere close to the intensity for this effect to even begin. The effect predicted by Maria Goeppert-Mayer was so small that a new unit of measure, using the square of the small area, had to be invented. To this day, the unit is called the “GM” in her honor. The effect would have remained just theory, without a light source intense enough to produce it experimentally. Charles Townes, the inventor of the laser, had such a device. His student, Isaac Abella (later one of my professors) was one of the first to demonstrate two-photon absorption experimentally, using infrared laser light to produce absorption at a factor of two less energy than Einstein’s model. The two-photon technique has revolutionized the ability of scientists (and if I were Sheldon I might add “…and biologists”) to study thick biological and even living tissue. A two-photon microscope uses precisely this effect predicted by Goeppert-Mayer. Hence the discussion: Sheldon complained to Amy she was cutting the samples to thin. You can’t slice tissue too thin for an electron microscope, but thick samples is where a two-photon microscope comes into its own. Lucky for us, Newport Corporation lent us a two-photon microscope, the one you see on the show. In a two-photon microscope, not enough energy is delivered to liberate the electron, but does excite the molecules of a flourescent dye with two photons. The resultant single photon fluorescence is a single photon of nearly twice the frequency of the incident red or infrared light, typically green and can be separated from intense incident light to form an image. Another advantage is that the rate of exication now depends on the square of the illumination, since the technique needs two photons to be absorbed. By carefully focusing the incident light, only one small selected region of the sample glows, allowing a detailed picture without the extraneous light from everywhere else, as you would have in a conventional microscope. And so we finally see scientists wearing lab coats on The Big Bang Theory. That’s what happens when you let in the biologists.